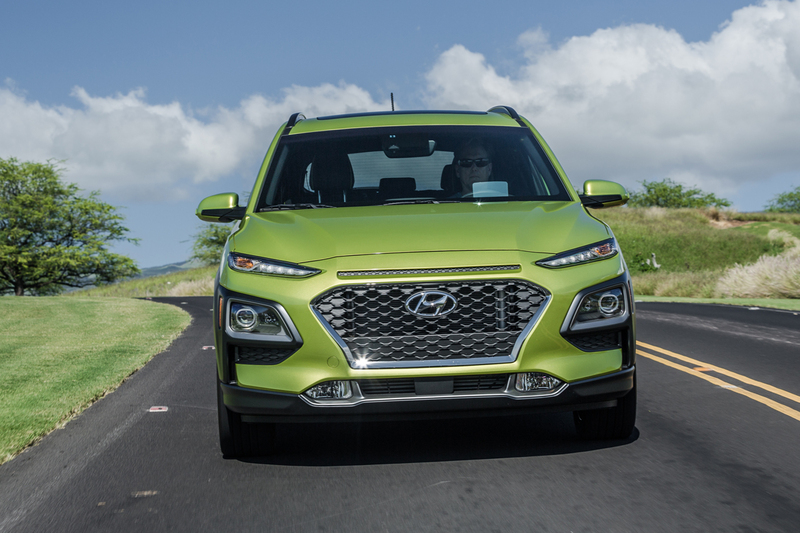 The latest entry into the compact crossover wars for our testing pleasure was the 2018 Hyundai Kona Ultimate AWD, a turbocharged well equipped thrill ride into tall seating position but not a real SUV land. While that sounds cryptic, we mean well. This is a car not an SUV, a crossover not a car. It’s what people want, why every car maker is stepping on and giving up the cars of their past to build one. 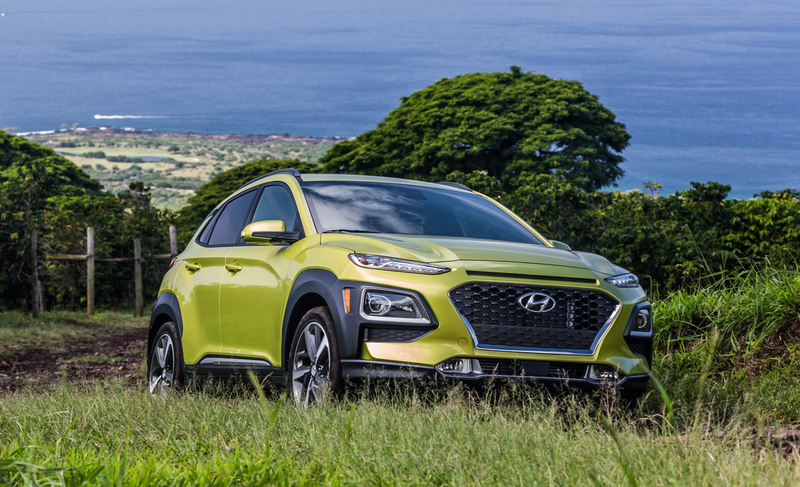 And the Kona, is Hyundai’s play. Our tester was top of the line and thus packed with all the bells and whistles singing to a tune of $29,805. 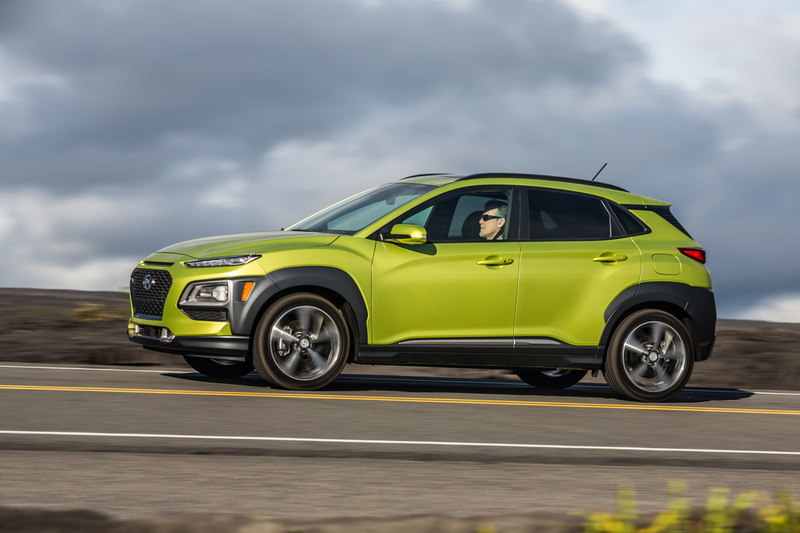 The Kona does start out at quite a bit less for the bast model however at $19,000 if you’d rather a FWD model with a few less things. In all you get styling that is extroverted to say the least, with lots of jutting angles and off-roady black trims to buff it up visually. With the Ultimate we had all the LED lighting razzmatazz Las Vegas could offer up along with the largest of its wheel selections at 18-inches. 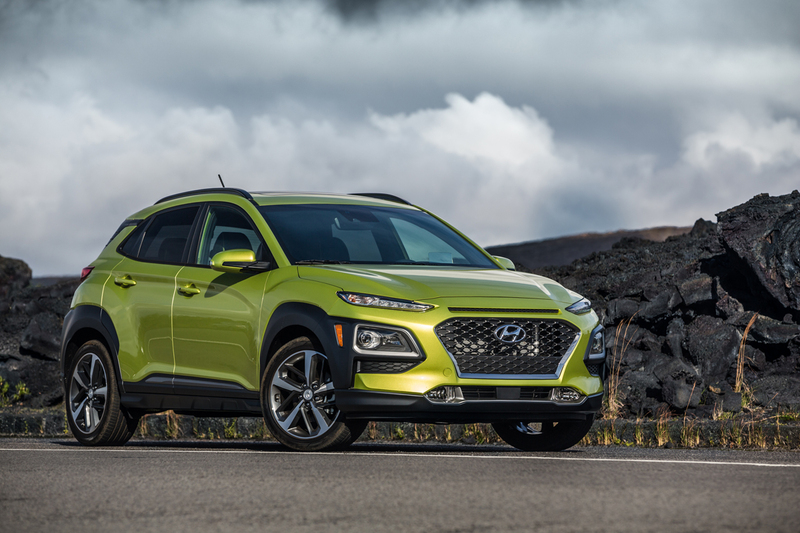 Styling is a subjective and opinion sourced topic and I rarely set foot in it but in this case I find that most of its forms, angles and shapes seem disconnected and lack the sophistication and finesse we’ve come to expect from Hyundai in the last decade. It almost appears they re-hired the stylists from the first generation Santa Fe and asked for a sequel. Nuff said. 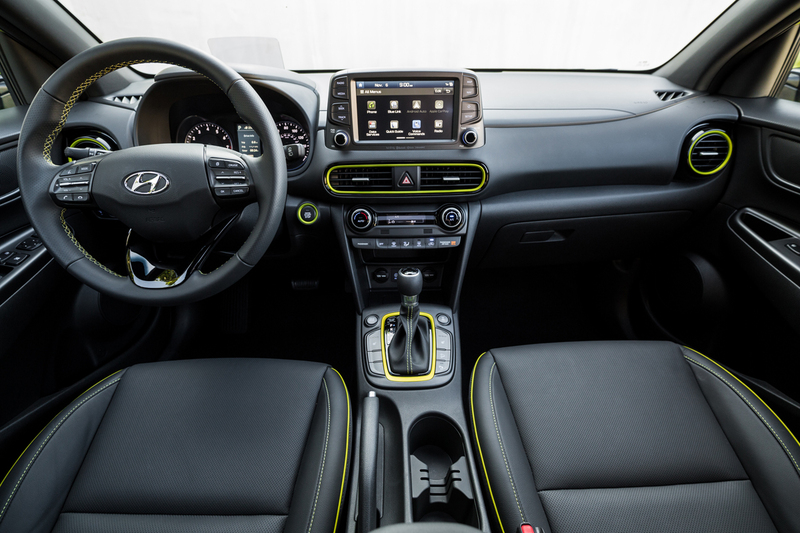 The interior of our tested brought in the bright exterior color with lime accents that I found playful however. 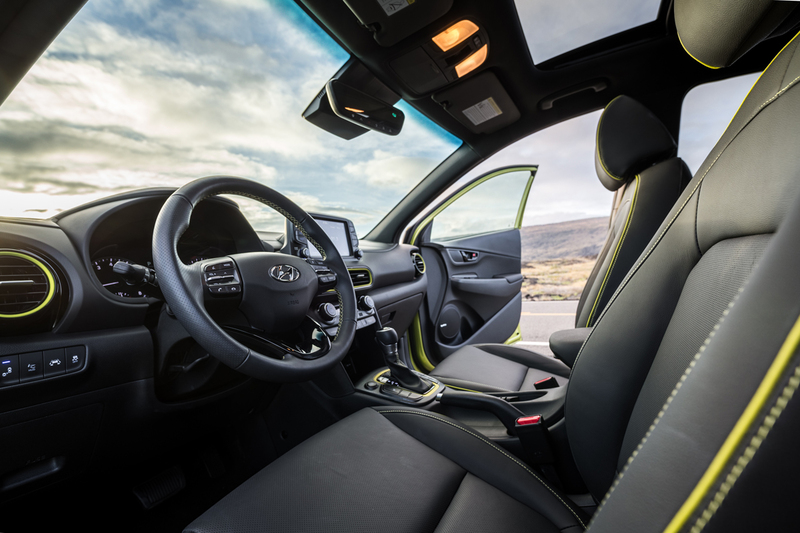 With the black leather seats comfortable all around and switch gear of a top quality and feel I found the cabin a nice place to spend time. 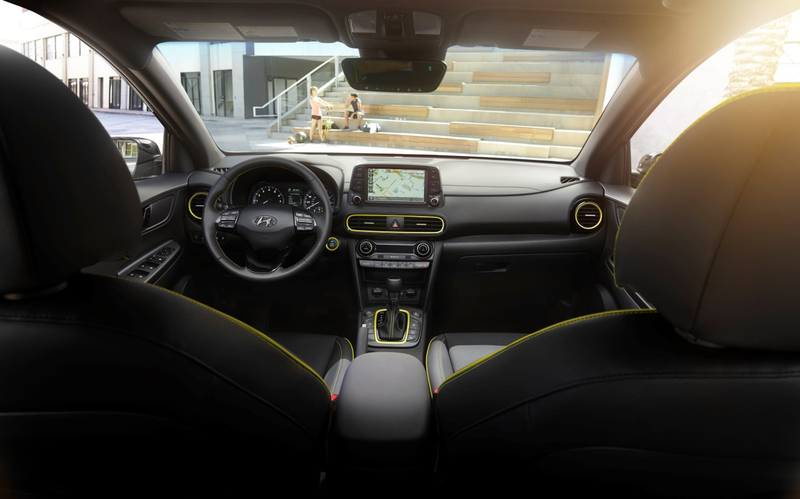 The design itself unlike the exterior is in keeping with much of the good work I have seen from Hyundai of late and its feature content for the price is quite impressive. 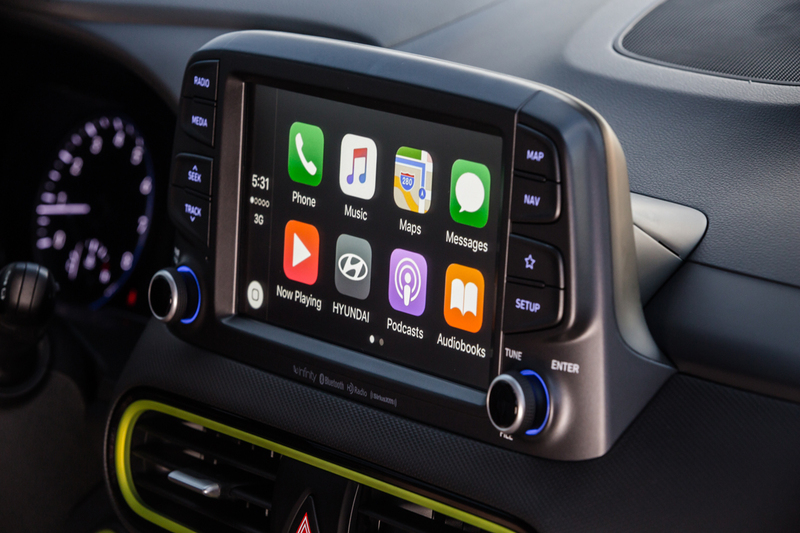 Climate controls and switch gear are top notch and ergonomic layout is well done. 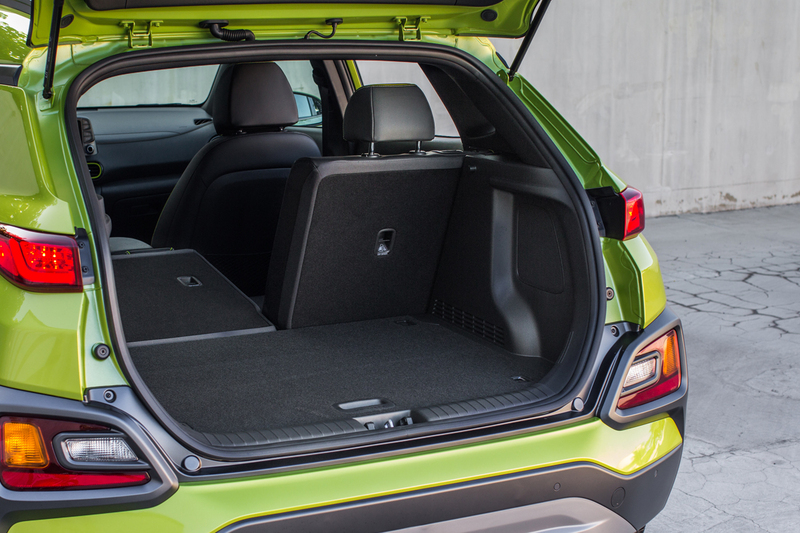 Cargo space is somewhat limited at the rear hatch as it does have a low roof line and a high floor, this is common in class, so not a standout gaffe. The one notable disappointment was an air conditioning system that was weak kneed against our Arizona summer – a standout in class. 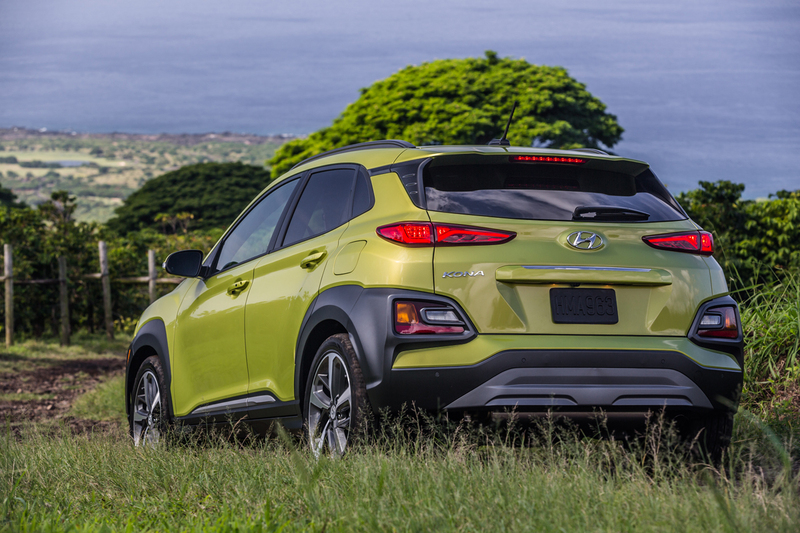 When it came to driving, its 1.6 liter turbocharged engine with 175 horsepower was impressive enough and moved the Kona around with spirit. This is an engine that impresses with its torque and lag free power band always. Disappointing was the lugging and jerky dual-clutch automatic transmission (DCT). At a stop it sometime judders and on take-off can lag before the clutches engage. Coasting slow and then applying power for instance never happens the same way twice. Fuel economy is rated at 26 mpg city, 29 mpg highway and 27 mpg combined. IN our testing we only achieved 23 city and 25 combined. 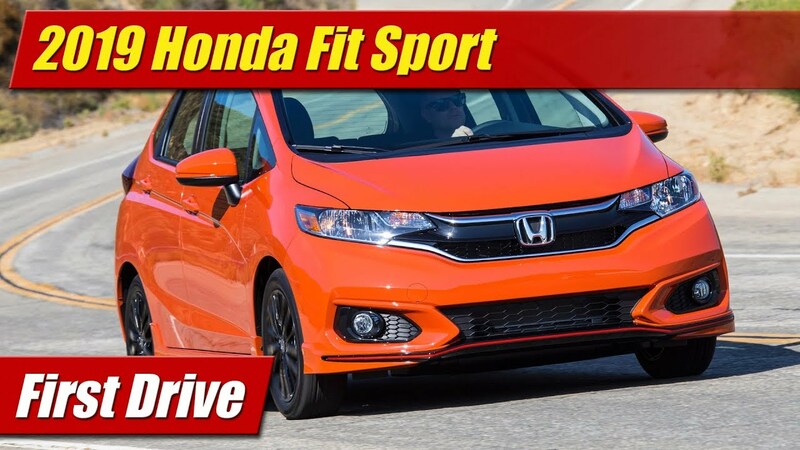 If you choose the 2.0 liter base engine with or without AWD, the fuel economy would be a bit better and we have found that engine and transmission to be more predictable in its behavior. Handling around town was a bright spot, offering up well isolated bump reactions and a quiet ride at highway speed. Steering is light for a vehicle in this class and cornering response is better than most given its tall profile. 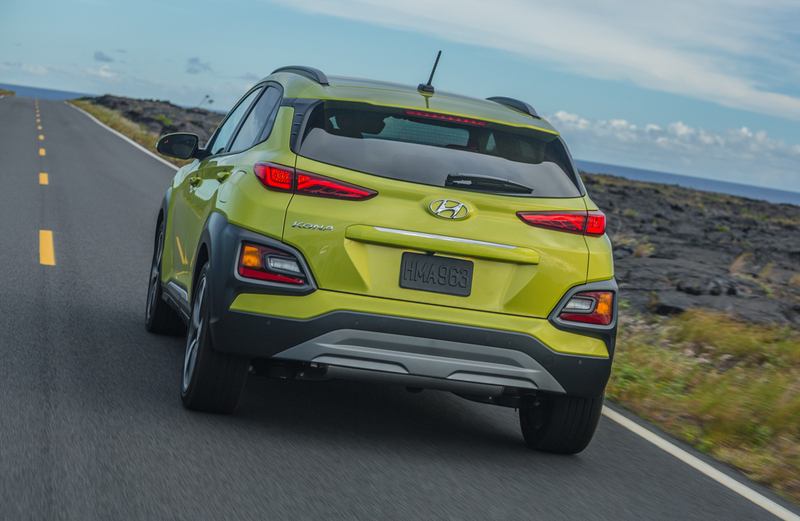 I tend to appreciate Hyundai branded vehicles of late for their high quality, buttoned down driving persona and high value. 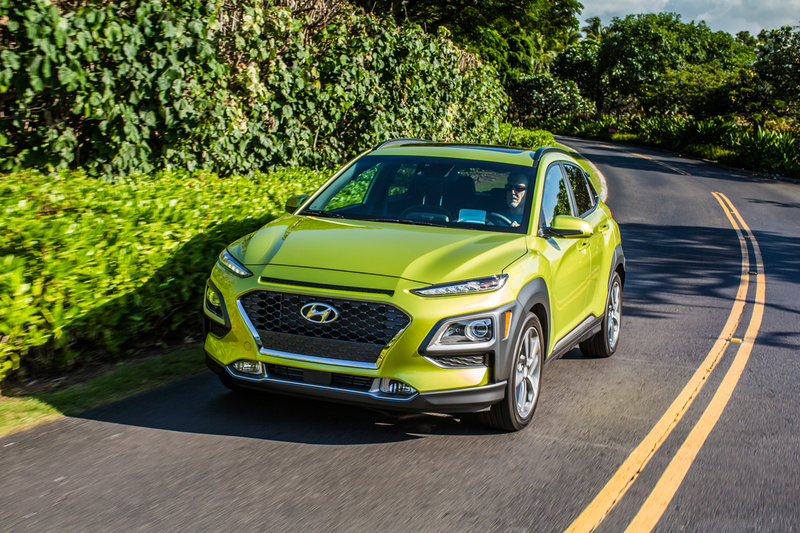 The Kona brings all of those attributes to the compact crossover class well, the only hold backs for me the styling details and its finicky transmission personality.